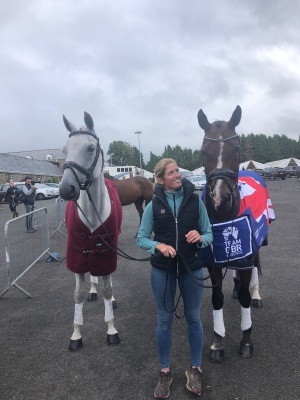 We were absolutely delighted to be selected for the Team GB Nations Cup team at Millstreet riding Caroline Harris’s and Rebecca Salt’s BAYANO. It is always an honour to be chosen to ride for Great Britain so we were very excited to have been given another opportunity. I was also riding AMAZING VIII in the CICO*** and my own DIAMOND HOLLY in the CIC*. We had a very smooth journey arriving early morning in Ireland and all the horses travelled really well. Both Barney and Maisie flew through the trot up on the 1st day and all three settled in really well to their stables. It was so lovely to have Maisie back at a big 3star and Charlotte definitely enjoyed having her best girl back at the big time. Princess had her CIC* test on the Thursday and overall performed really well scoring a competitive 30 to lie in 3rd place after the first phase. She show jumped really well that evening, but unfortunately just rolled a pole, her first one for months! There was no particular reason just one of those things and we can’t really complain as she has been so ultra consistent in this phase. 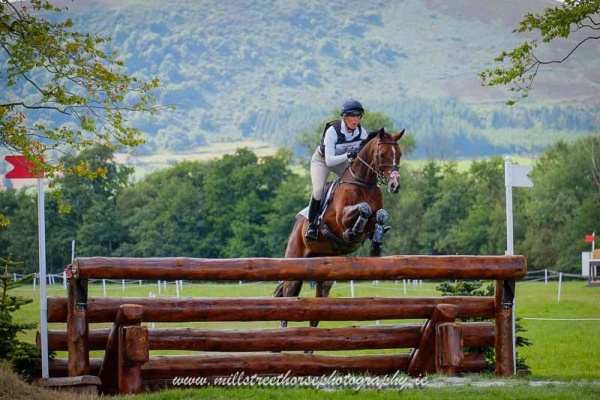 Her XC was very big and bold with some strong water complex’s and a traditional Irish bank. Princess set off and felt quite green to begin with but gained in confidence the whole way round and finished well inside the time. She moved back up and finished in 4th place. Another cracking result for her, Its so exciting she is becoming more confident and consistent each time. First up in the CIC*** dressage was Barney, he can often be a little cheeky on the flat and go very light in the bridle but I was very happy with how he felt performing a completely mistake free test. Two of the judges had him super competitive on well over 70% but sadly the third judge put him over 11% and over 8% lower. To be honest, this is a completely unacceptable difference and one that in other disciplines would have required a review of the marks and the judge. This left Barney on a score of 30, which whilst was still competitive was not the mark he deserved so we won’t entirely thrilled! Amazing VIII had her test that afternoon and performed very well back in that sort of atmosphere, she made a few small errors in her halts where she tried to drop behind me but otherwise was very good to score the same mark as Barney. 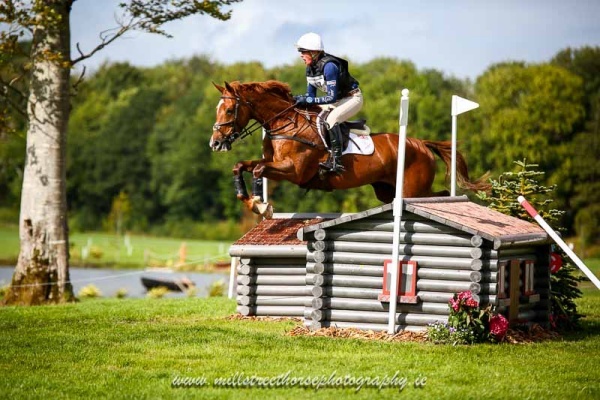 The XC was tough with big waters and a very tough bank which caused a lot of trouble. The time was also very tight. Our first team member out was Alex Bragg who did a fantastic job to come home inside the time, so Barney and I really needed to post another fast clear for Team GB. We set out really positively and he gave me a great feel, the Irish bank was a bit hairy but he stayed super genuine and honest and actually made it look one of the easiest attempts all day when I watched it back. Unfortunately we were then held about half way round for a good 20 mins. This can really upset the rhythm and for a horse like Barney who needs motivating its not always easy but he picked up really really well and came home inside the time! Such a great performance especially as there were only 4 all day who made it home with no penalties. Amazing VIII also set out brilliantly and gave me a seriously good feel, we took a slightly longer route out of the 1st water to avoid pulling her around too much and she finished with just 3 time faults. On the Saturday night Amazing looked incredible like she hadn’t run at all, Bayano was a little foot sore having slightly sprung a shoe so Charlotte worked really hard on him and he came out on Sunday morning looking incredible. They both flew through the trot up looking fresh and on top form. 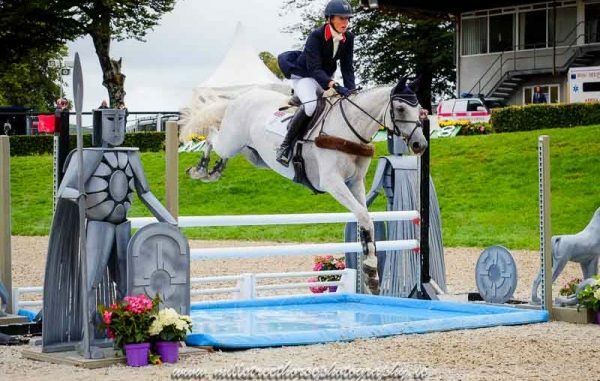 The showjumping was up to height and very technical with an unusual open water. In the past these have been Maisie’s nemesis so I was a bit nervous but she surpassed all our expectations and went in to jump a super clear. It was a fantastic moment for our whole team who just adore Maisie, she owes us nothing and we are so grateful to have her back at top level. Barney worked in beautifully and felt on springs, he started his round in text book style but very uncharacteristically lowered two rails coming out of both combinations to finish on 8 faults. I was absolutely devastated to have let him down as both of the rails were mine and he is normally the most consistent show jumper out there, but overall I was thrilled with his performance over the weekend. Amazing VIII finished in 6th and Barney in 10th and most importantly the team ended up with Silver behind the french. It was a great competition and a massive thank you to my incredible team mates; Alex Bragg, Francis Whittington and Millie Dumas and our team manager Philip Surl – everyone made it a such a wonderful experience and we can’t wait until the next one.